Everything around here exists for the water. For the couple months of summer, it’s Lake Huron and all the bays and channels and coastline. For the rest of the year, it’s the precip….five months of ice & snow and 5 months of rain! I’m only half-serious. The rain is not a season of monsoons, because no weather pattern lasts very long around here…the wind is constant and brings change within minutes! My point is that everyone has a boat and a snowmobile, and much of the employment involves boats, marinas, and the repair of boats and snowmobiles. 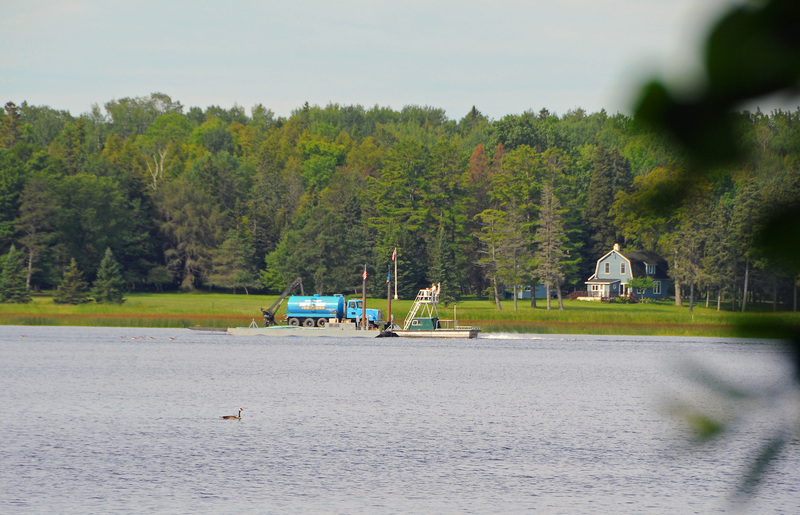 As I wrote the preceding line, an island barge came into view….with a fuel truck! It was headed for one or more island destinations. Because most of the islands do not have roads, I expect this delivery would involve stopping at multiple docks to fill homeowner tanks with gas for boats and personal watercraft, and maybe heating fuel (it was in the 40s a couple nights ago!). 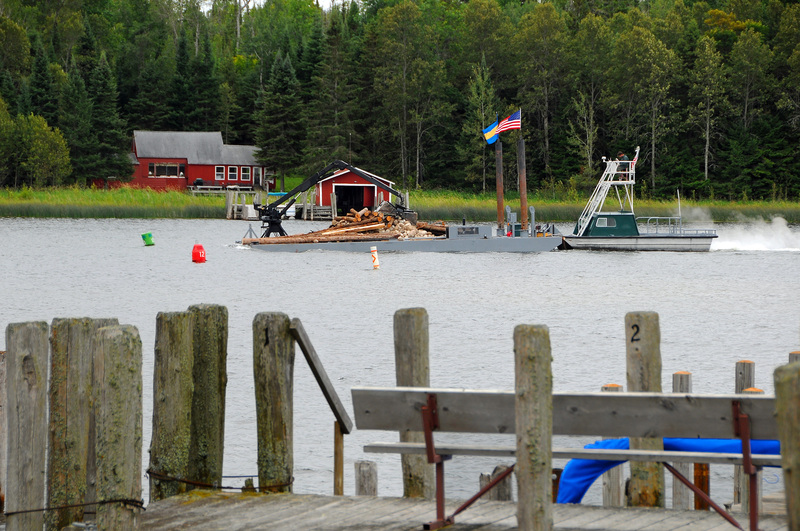 Yesterday, the same barge came past our dock with a massive load of timbers and rocks to build bases for a new dock somewhere. Notice the wind was blowing so strongly in the direction of his travel, that the barge flags flew ahead! That’s not smoke out back, it’s heat from the engine exhaust in the chilly morning air. 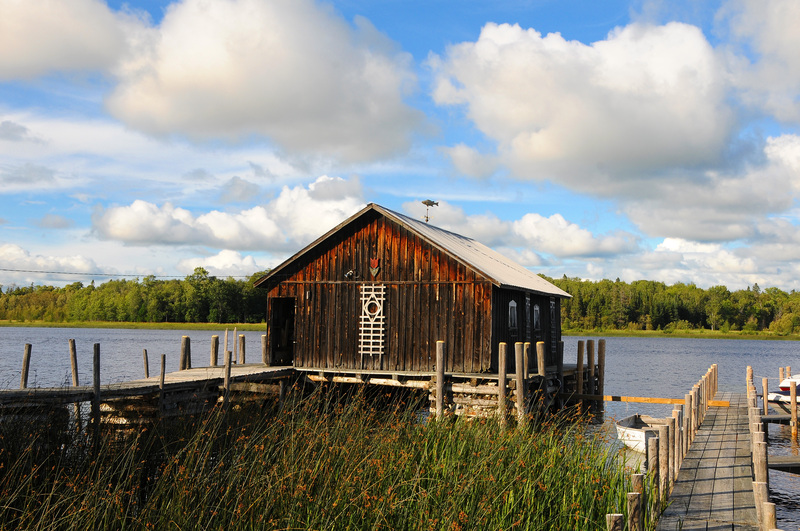 The first photo above shows a homeowner dock and boat house. You can see the substantial bases they build for the docks…to withstand years of use & abuse from waves, boats, and ice! The boat house is similarly substantial, and designed to suit the owner’s taste. Ha! Again, as I was writing, here came another barge past our dock, this time hauling a completed cage for the base of a dock. 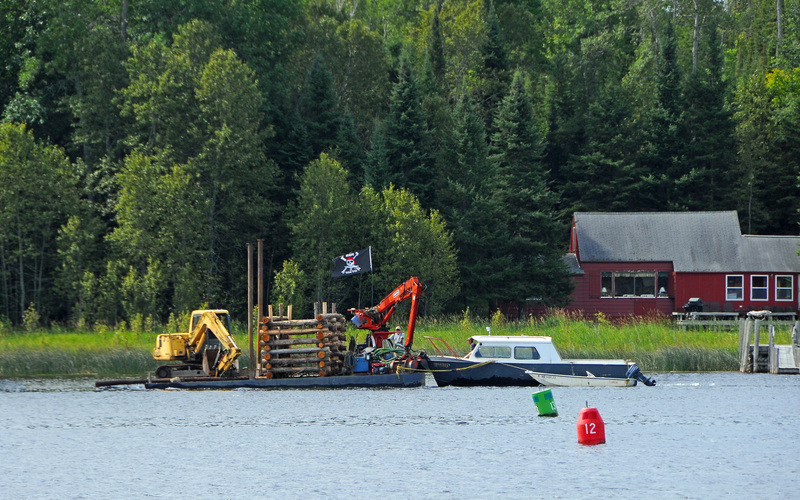 Notice his Jolly Roger flag: “Fish or Cut Bait” it says! 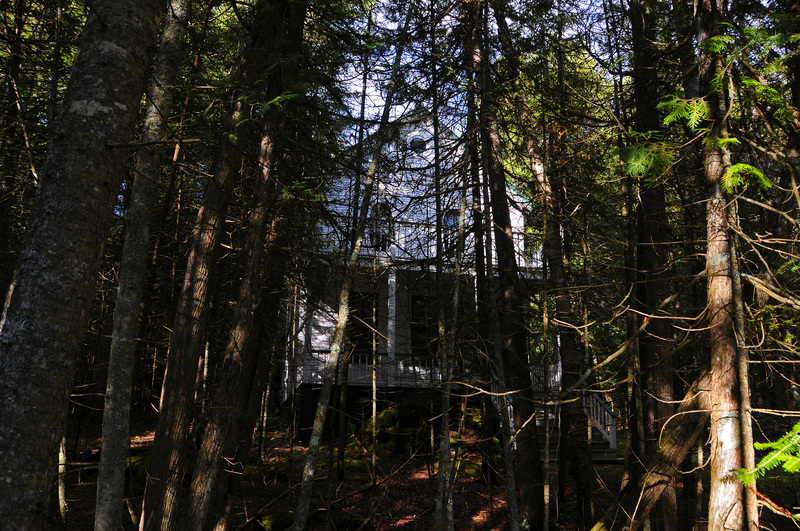 Moving on, here’s a summer cottage that was really “built in the woods”! 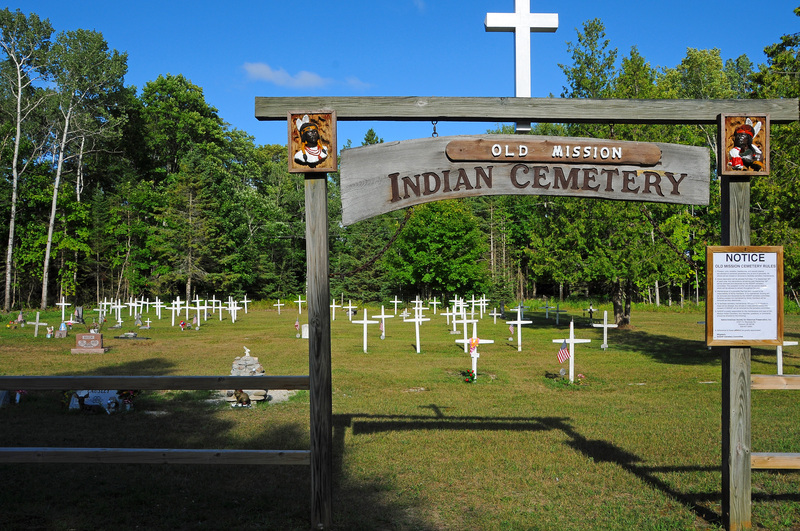 Indians have quite a noticeable presence in the UP, mostly in the form of casinos! There is at least some sensitivity about them among the whites in this area, because at some point in recent years, the Indians were granted exclusive rights to fish commercially around here…which put some whites out of work, and forced restaurants to buy from essentially one supplier. Indians are treated separately in many ways, apparently mostly by choice. Here’s their cemetery near our park. Lastly, we leave you with a scene across the channel. 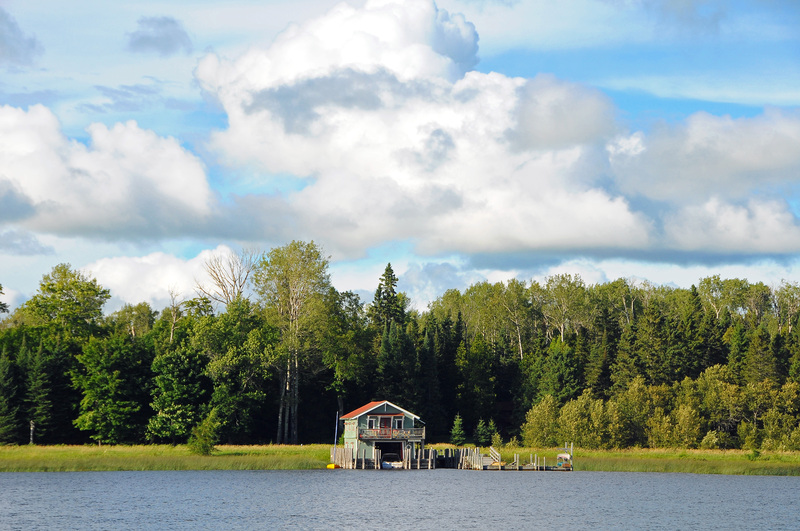 The house is built on top of the boat garage, there is room for multiple boats to dock, there is no lawn or yard to care for, and there is no driveway or nearby road. Ahhhhhhhhhh! Sounds like you can watch from your front row seat. Wonderful! I feel like I am at the Johnson gym on a travel Saturday night program! I don’t even have to leave my house to visit far-off places, and enjoy the scenery. Thanks for the descriptions. Whoa, now there’s a memory! But I’m no Don Cooper…. Do people have lawn mowers?What to do without mowing grass. No mow. These people really know how to relax!